A unique line of handcrafted jewelry featuring colorful necklaces, bracelets and earrings constructed from recycled plastic components reclaimed from plastic shoes. Many women are trying to live a green lifestyle by consuming less, and are looking for ways to dress up and to give gifts that are not at the expense of the environment or the artists who make them. 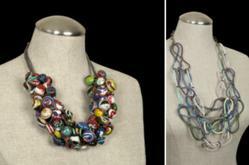 For Spring 2012 Jenne Rayburn introduces a complete line of eco-friendly designer jewelry made from recycled plastic reclaimed from plastic shoes. Pressed and twisted, then cut and woven, Jenne Rayburn constructs the plastic bits into multi-dimensional shapes, strung together using brass wire, to create dynamic jewelry accessories. These statement necklaces repurposed from recycled plastic are an accessory that instantly updates your ensemble, while keeping plastic out of our oceans and landfills. Conscientious and fashion savvy shoppers now have a another great option to support conservation.